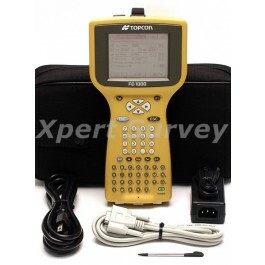 Topcon’s new FC-1000 was designed and built by Topcon, not some third party manufacturer. We decided it was about time that a rugged field computer for surveyors, should be designed and built by the world leader in surveying instrumentation. We have been building instruments for surveyors for over 70 years. We know what you need in the field, and more importantly, we know what you demand! Super-fast Hitachi SH-4 RISC Microprocessor running at 300 MIPS! This new Windows CE software installs easily in just minutes onto the new Topcon FC-1000 field computer, or other popular Windows CE devices such as the At-Work Ranger, Compaq IPaq or the Panasonic Toughbook. Providing the user with an intuitive graphical user interface, TopSURV has set a new standard for field data collection, stakeout, and control work. The menus and screens have been designed with the operator in mind. No hassles of hunting around for an option hidden deep inside some sub-menu. All of the important field operations and features are available at the press of a button or tap on the screen. Graphical point path leads you to the desired point. Linear distances and graphical display all in one screen. Easy to stop and start staking, or move to the next point. All raw data visible to the operator along with simple entry fields for Point ID, Descriptor Code, and Rod Ht. Collect data in the real-time Map Screen as well as standard text screen. Tracking status and battery indication always in view. Other important field controller functions include Auto-Base and Auto-Rover operations for RTK GPS positioning, Auto-Topo functions for collection by time or distance, time stamp of all raw data, extensive offset collection, and much more.